Ah Seymour, what a handsome devil this boy is. We are so in love with him and his cheeky ways! Seymour is perfectly litter trained, although he does have his own thoughts on where the litter tray should be placed. I doubt this boy has seen an enclosure before, and quite frankly, it is beneath him. Give him walls, and he'll look for a way out of them! Given that fact, this Houdini will need a very safe home, so he doesn't end up on the streets again. 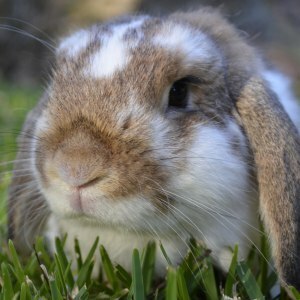 With such striking good looks, he is confident, always doing something, and is a bunny who will not be content without lots of playtime and attention. Don't adopt him if you're looking for a bunny. If, on the other hand, you're looking for a free range (with a safe night time pen), cheeky, cat/dog hybrid that will wake you up at night and make you laugh... well, Seymour here might be your guy. He'd really excel learning tricks too, he just loves to be learning and doing things. Scooter is a very special boy indeed, who has such a huge love of life. Sadly, before rescue Scooter didn't have the best start. He was injured, and the scum left him in a box, abandoned and in pain. Scooter has had his back leg amputated as a result, and is doing just fine, having fully recovered at the shelter. He is such a character, and to prove how adaptable animals are, he scoots around on his three legs as fast as any bunny you've seen! He is playful, cheeky and oh-so loveable! Scooter has been affectionate from the day he arrived. He spent quite some time with our vets beforehand, who did report some territorial behaviour, and biting. However, I would put that down to being in pain, and being undesexed. Because, through all our temperament testing procedures, he has been nothing but sweetness itself. He shoves his little head under our hands for pats at any opportunity. He loves to be picked up, carried and cuddled. Yes, he actually likes it! He has no fear, as you can see he gets along really well with dogs. 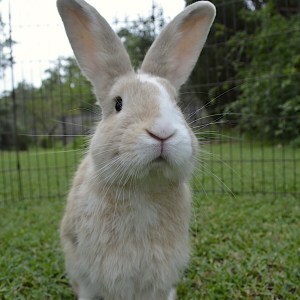 He is just the sweetest, most adorable bunny, and his adoption fee reflects this. 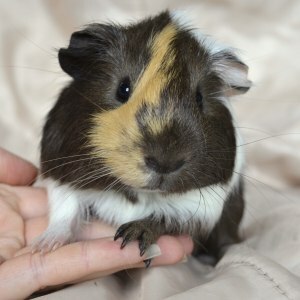 Due to Scooter's special needs, we are going to be very selective over his new home. To be honest a first time owner would be ideal, as we may have more hope of them listening to us in regards to what he needs, and long term care. Scooter also doesn't want to be adopted as a poster/token pet. He's not around to make someone feel good about themselves for adopting a 3 legged bunny, nor to help them seek fame within the community and validate what wonderful animal lovers they are. He is a happy, healthy and wonderful bunny who will be very popular. 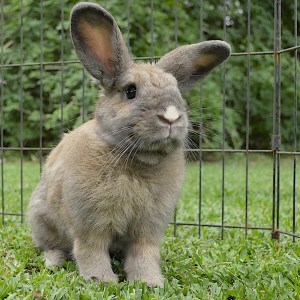 If you are wanting to "rescue" or "save" a bunny, go to your local pound. Or, ask us about our long term bunny rescues, who have been waiting for homes for over a year. Scooter will make someone very happy, and they'll be blessed to have such a character in their home. We're in no rush to part with this furry little pocket-rocket. Thumper is a gorgeous boy with lovely manners. He is super easy going, great to cuddle, pick up and hold. Obviously very used to kids. Our little black blob is a mini lop of course, and we'd guess around 2-3 years. 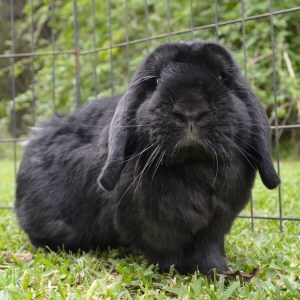 As a mini lop, he is a heavy moulter, but it's black so just make sure you have dark clothes on ;) Thumper loves his food, so much that every night, no matter how close he already is to the ceramic treat bowl, he will pull it towards himself as if the bowl is trying to get away. Thumper has not been good with other bunnies in the past, so would really suit someone that wants a single bunny to lavish attention on. Paul, and his friends: Ringo, John and (George-adopted), are all lovely boys looking for a home with another pig, or each other. They all have unique markings and lovely personalities. They can be a bit scared at first, but for their age and for what they've been through, they are pretty settled and love a cuddle. They are so relaxed, they even like stretching out and having a nap right in front of you. 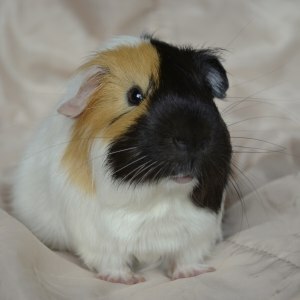 Male guinea pigs can be a bit nasty towards one another, which is why it's so surprising how laid back these fellas are. They haven't had any squabbles, even when meeting new guinea pigs and new smells. Ringo, and his friends: Paul, John and (George-adopted), are all lovely boys looking for a home with another pig, or each other. They all have unique markings and lovely personalities. They can be a bit scared at first, but for their age and for what they've been through, they are pretty settled and love a cuddle. They are so relaxed, they even like stretching out and having a nap right in front of you. 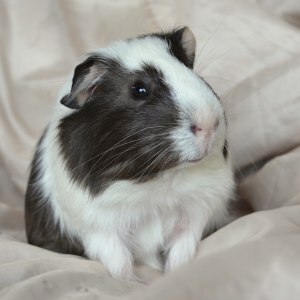 John, and his friends: Ringo, Paul and (George-adopted), are all lovely boys looking for a home with another pig, or each other. They all have unique markings and lovely personalities. They can be a bit scared at first, but for their age and for what they've been through, they are pretty settled and love a cuddle. They are so relaxed, they even like stretching out and having a nap right in front of you. 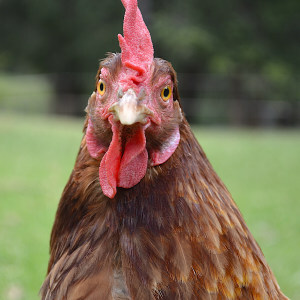 Gagarine and Coco are two lovely isa brown hens, looking for a home together. As is typical of the breed, they are very friendly and well behaved. The are used to dogs, and obviously been well cared for. One girl is laying eggs almost every day, and they are whoppers at over 100g. These girls are looking for a great new home where they'll be able to free range, and roost in a safe and secure enclosure at night. They love being involved with the family, sharing toast, etc. Maria is a sweet and gentle girl, who has been very easy going at the shelter. She is a vienna marked sooty fawn, and is every bit as beautiful as that sounds. Maria shows no territorial behaviours, has been great to handle, can be a bit shy on first meeting, and would probably make a great partner for another bunny. Half-an-Half and her friends are looking for new homes! 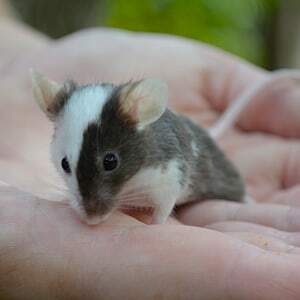 Very sweet and well handled mice babies. 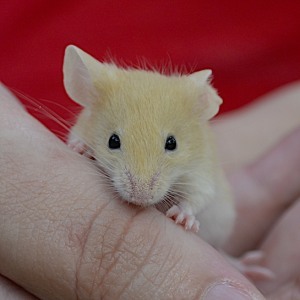 They must have another mouse as a friend in their new homes. Obviously these guys are for pet homes only.